Happy official first week of summer to our northern furfriends! It's winter here (brrr...) but this is one of our very special prep-prepped and schedule posts for during the current moving chaos. Puppermint patty frozen yogurt treats were one of the many frozen snacks made and eaten during our sizzling summer past. Yummy yogurt pops, happy dogs, and minty fresh(er) breath. Yes, please! This is kind of a recipe, but more of an inspiration as there are no right or wrong precise measures - you simply mix the ingredients to suit your and your dog's preferences. easy peasy! Measure your mold capacity (see tips below) to determine the required volume of yogurt. If your yogurt is thick or you want to lighten the treats a little, you can dilute it with water. Split the yogurt into 1/3 and 2/3 for mixing and creating the layers. Starting with the first carob layer, spoon to fill your molds roughly 1/3 of the way, lightly tap the mold to level (if required) and freeze until firm to the touch. Add the mint layer, lightly tap the mold to level (if required) and freeze until firm to the touch. Add the final carob layer, lightly tap the mold to level (if required) and freeze thoroughly before removing from the molds. Remember to go natural or take care when shopping to avoid artificial sweeteners in ingredients like yogurt for your dogs – xylitol (also identified as sweetener E967) is particularly dangerous for dogs. If you are using a thick-style yogurt, you may find it helpful to water it down for easier mixing. Not keen on dairy? You can experiment anything pet-safe as an alternative base, including simple water, as the base. Get creative! It's fun! 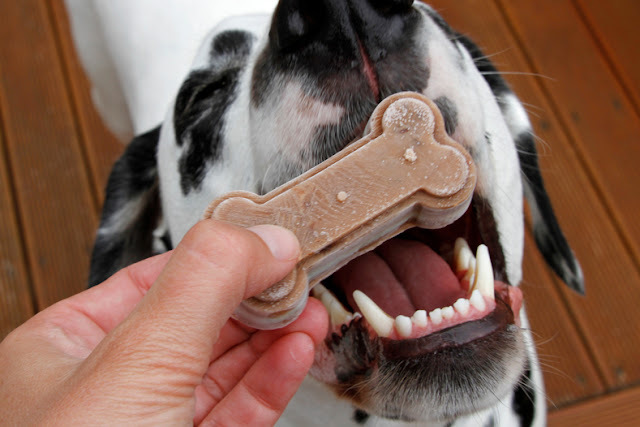 Most varieties of edible/culinary mints are safe for dogs in small quantities; however, don't use mint oils or flavourings as they can contain unsuitable additives. Keep the quantities small to avoid overpowering scent/flavour (and for tummy safety as with any herbs for dogs). 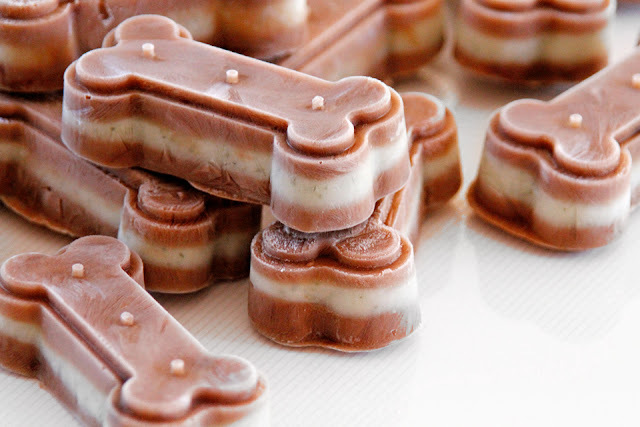 If your dog isn't a mint fan or you're not in a minty mood, these are just as yummy with a plain middle or as a simple all-carob frozen treat.